The Museum Gardens has been the focus of much attention in recent weeks. Partly because of the massive and much-anticipated event which has led to the construction of this seating, and partly because of the tree looming in the middle of the seating. Well, it was looming, when this photo was taken on 5 July. Now it’s barely visible, surrounded by seating. York Museums Trust applied to fell the tree and will now be able to do so, following the decision not to place a Tree Preservation Order on it (see links below). The plan is to remove the tree when the seating has been dismantled after the Mystery Plays production. This has caused a storm of protest in the local paper, in letters and comments on the website. I’m all for protecting trees, but can’t really understand why there’s such an outcry about the felling of this one. I thought I’d share my thoughts, in case anyone’s interested. Looking carefully at the photo above (it can be enlarged) does beg the question: what is meant to be the view here? What is supposed to be the most obvious feature, across this wide expanse of lawn? The tree? We don’t have much of our abbey left. Most of its stone was nicked and taken off to repair other buildings. This bit standing is the only conventionally photogenic bit, and the original garden design was intended to make the most of this picturesque ruin. Then about twenty years ago, for some reason, a tree was planted right in front of one end of it. Personally I’ve never liked the ‘open’ layout particularly – it’s a bit municipal. I prefer my abbey ruins more overgrown and untidy-looking. But this is what we’ve got, and we’ve got to make the best of the most important features. This ruined wall features on many photographs. They’re not lining up to take pictures of that tree. What seems most obvious to me is that if it isn’t cut down now, by this generation of the garden’s guardians, there will no doubt be repeated calls to remove it, in future decades, as it gets bigger and bigger and looks more out of place. And of course it’s much more upsetting to see a mature big-trunked tree felled (as in Irton) than it is a young tree, so perhaps in felling it we’re saving future generations from that trauma. Its aesthetic value is a matter for debate. It’s a conifer, and looks a bit ungainly compared to the beautiful deciduous trees around the gardens. Here it is again, from a different angle, from the front of the Yorkshire Museum, back in 2007. Where again it is rather intrusive and not particularly handsome. 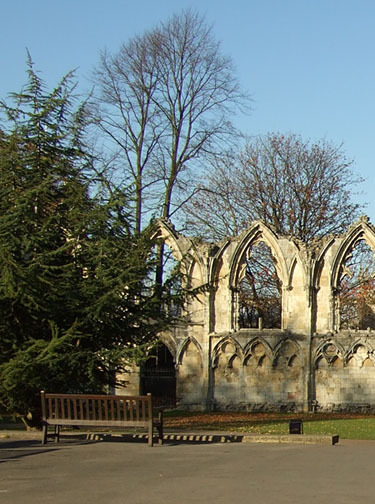 The Yorkshire Philosophical Society aren’t happy, which is understandable, as they were involved in the original tree planting and it commemorates a museums-related centenary. But the legacy of the Museums Association is all around us, in our fabulous museums, with one of the most impressive just metres away from this commemorative tree. Objectors have commented that the reasons for the tree’s removal given in the application don’t ring true. I think we all know that the other main issue with this tree is that it gets in the way of the seating for the Mystery Plays, as clearly demonstrated by the fact that the seating has been built around it. On Radio York this morning one of the interviewees mentioned future productions, and suggested a four year cycle of productions on this scale. Clearly the organisers of future productions don’t want a tree poking its branches through the stand next time – it looks silly. Apparently Prince Andrew on a recent visit to see the stands being constructed enquired in a joking fashion who would end up sitting in the tree. It is of course because the tree was planted by his ex-wife Sarah Ferguson, Duchess of York, that the local paper have dubbed it ‘Fergie’s tree’. The royal connection has been stressed by some objectors to the felling. But Fergie has always seemed to me a fairly robust, jolly kind of person, and I doubt she’s bothered. It’s not like she dug the hole herself, is it. Many applications are made every month to fell trees in this city and its surrounding villages and suburbs. I hope that people are paying as much attention to those as they have been to this one. I was trying to list them on these pages, but soon gave that up, as there are so many. Focus has fallen on this one, when the imminent loss of a mature sycamore not far away, on Deangate, has been barely noticed.